To stay in a real castle is a treat. Let me emphasize the word ‘real’. There are plenty of 19th Century piles (or older piles which were so vigorously ‘restored’ by the Victorians that they must really by regarded as creations of the 19th Century) which have opened their doors to paying guests. 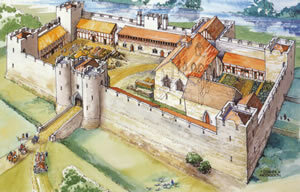 But these, however impressive, are not what those of us who are still little boys at heart would regard as real castles. 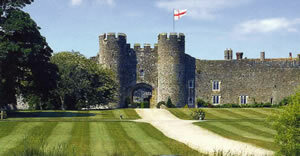 So let me state it clearly: Amberley Castle is a real castle. In fact, its authenticity is so evident and so magnificent that it made me feel almost mediaeval as I approached the entrance at the end of its long drive. I had only the closed gate to worry about – unlike those who came here centuries ago, who must surely have looked up the hill to the massive 60 feet high battlements with a mixture of wonder, awe and profound apprehension. In our gentler age, allow me to share with you the secret of that closed gate. It opens automatically when you drive your motor car right up to it. Not knowing this, I spent some time looking for a switch or an intercom. In the end I resorted to the dreaded portable telephone from the motor’s glove box and called the hotel reception desk. Having been told the magic procedure, I was soon trundling through the huge curtain wall of the castle itself. For 900 years the surrounding area has been dominated by this mighty statement of power and wealth. Its history is littered with the names of kings and bishops and dukes, beginning with Henry I in 1100. But now it is given over to comfort, luxury, good living and the pursuit of decent pleasure. 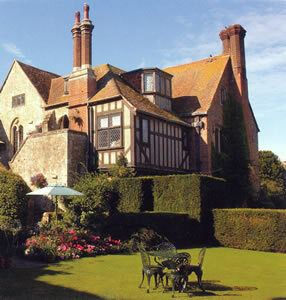 Within its 12 acres of manicured gardens are tennis courts, a putting green, a tree house and a croquet lawn. It has just 19 bedrooms, so the atmosphere is that of a very grand private home. I was met immediately by Oliver Smith, the General Manager. This young man must be doing a good job, because every member of staff I encountered was exceptionally friendly and helpful, and all my many little requests – whether it was to increase the softness of the bed, or to supply some cds of classical music or to bring me more soap for the bathroom – were fulfilled with speed and commendable enthusiasm. The rooms have names, and mine on the second floor (there is no lift) was ‘Chichester’. 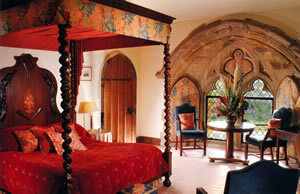 This was a ‘Deluxe Four Poster’ and was therefore £615 a night, bed and breakfast for two. It was dominated by the giant bed, a splendid construction of carved oak. Indeed, the whole apartment was full of ancient dark wood – in the ceiling beams and in the numerous cabinets and tables. The carpet and the upholstery of the settee and easy chairs were coloured red, which added to the warm atmosphere. And then there was my very own open fire. True, it was fed by gas, but its dancing flames made an attractive focal point for this thoroughly comfortable chamber. The details indicated that much thought had gone into this accommodation. The small wireless was a proper one, with a handle, so that I could move it about. In the walk-in wardrobe were an ironing board and an iron. 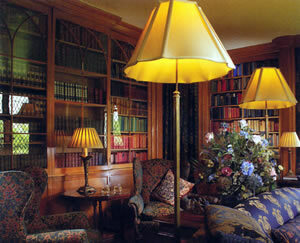 The lighting – from 3 table lamps, 3 standard lamps and a pair of wall lights – was gentle and effective. And there was coffee-making equipment and a tin full of biscuits, so that – with Brahms’ First Symphony coming from the cd player – I could relax in front of the fire with a warm brew and something to nibble. Through a curtained entrance was the bathroom. This was a contrast to the bedroom, being exceptionally light and bright – not least because of its large bay window, into which had been built a substantial, almost circular, whirlpool bath. Next to it was a separate shower. The opening to the area with the two wash basins, the loo and the bidet was guarded by a pair of dragons carved in wood, a feature which gave a certain frisson to my ablutions. I made a note to mention the shaving mirror, which – unlike most of these items I encounter – was positioned in exactly the right spot. The toiletries were by Anne Semonin of Paris. You will have gathered that I liked spending time in ‘Chichester’. 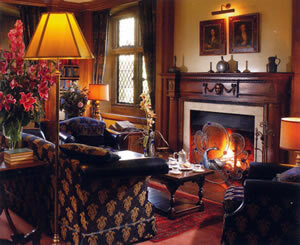 But I also made much use of the hotel’s sitting rooms. There are three on the ground floor and, the weather being chilly, each was provided with a blazing log fire. It therefore became my habit to seek out one of the comfortable armchairs, order a plate of sandwiches and drift off into a contented doze over Handling Edna by Barry Humphries, as I am a fan of the Antipodean housewife and superstar. 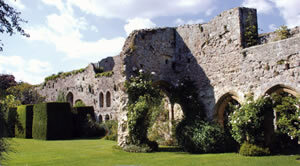 This was not, of course, my only experience of the food at Amberley Castle. The dining room (pictured) is a vaulted chamber on the first floor. 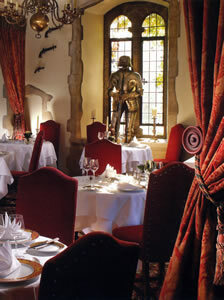 Here I was shown to a table on a dais by the mullioned window, opposite the stone fireplace, by Didier Cuny. He is the Restaurant Manager, and comes from Dijon. He ensured that all ran smoothly and well. The napery was starched and white, the glassware was by Riedel, each table had a candle in a silver candlestick, the salt and pepper pots were silver and very grand, the young waiters were smart in their black waistcoats and – mirabile dictu! – there was no canned music. Everything, then, was set for a splendid meal. And that is precisely what I got. 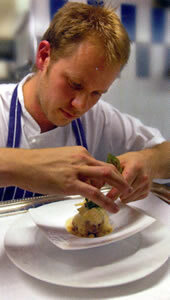 James Duggan (pictured) is a chef of real talent, with an educated palate and an intelligent approach to food. He is also a local lad, who has returned to Amberley after working in Michelin-starred restaurants in London and Hampshire. 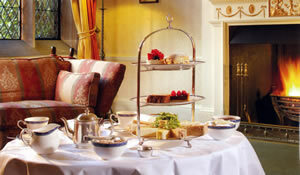 His cuisine can be tried in the three-course set lunch for £32.50. 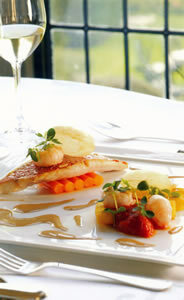 At dinner three courses from the carte are £65. I chose four courses, plus cheese. A nine-course tasting menu is £87.50. Chef Duggan describes his menu as “classic British dishes with a modern twist”, and I am happy to concur. Even before the dinner proper began, I found myself impressed by the clear, direct flavours of the nibbles – plump whitebait and morsels of deep-fried chicken. Then I tucked into a bowl of soup. My enthusiasm for soup is normally modest, but this was excellent in both conception and execution: a full-bodied minestrone, with a decent piece of luscious halibut, confit of fennel and tomato macaroni. Then came a change of pace, with a display of subtle harmony which was the highlight of the meal. Loin of wild rabbit came with sausage of braised rabbit leg, cranberries and cèpe purée. Each element of this sophisticated dish was exactly right. It was wonderful to eat. After this, the same approach to veal – with roasted loin, boudin of shoulder, chervil root purée and cured blackberries – proved almost (but not quite) as enjoyable. From the cheese I will commend to you a spectacularly good Stilton. My pudding was a ‘deconstructed’ rhubarb cheesecake, with rhubarb jelly, rhubarb sorbet, red wine caramel and nut clusters. 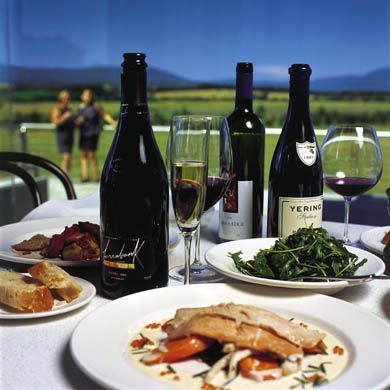 The wine list offers 150 bottles, plus 8 magnums and 36 halves. It skips around the world to good effect, with prices running from £29 for a muscadet from the Loire to £1,410 for the 1999 DRC Romanée-St-Vivant and £2,895 for the 2002 Pétrus. Other French bottles to catch my eye were: 2002 Cristal (£450), Krug Grande Cuvée (£300), 2005 Yquem (£1,300), 1989 Margaux (£1,000) and 1998 Mouton Rothschild (£960). I went to Chile for both my wines. The white was a fresh, eager chardonnay with hints of mango (Chilcas Reserva, San Rafael, Valle del Maule, 2009 - £31), and the red was a fine, well-rounded merlot with lots of ripe fruit (Valdivieso Reserva, Don Alberto Valdivieso, Central Valley, 2009 - £32). It was back to the restaurant for breakfast. Once again, it was such a relief to find a complete absence of canned music. Thank goodness, Amberley Castle is too civilized for such nonsense. (How I wish that hotels which insist upon inflicting their musical tastes upon their guests would realize what irritation they cause. But perhaps they do – and simply don’t care.) No buffet, I am pleased to report, so everything was brought to the table by the charming waiter Aurelian (from Lyon). And everything was of high quality – the mushrooms on toast, the bacon, the jam and honey, the fruit salad (of kiwi, pineapple and passion fruit) and the brioche. There were even crumpets – a comestible we see too infrequently nowadays. This was a leisurely and satisfying breakfast. Indeed, my whole stay was leisurely and satisfying. 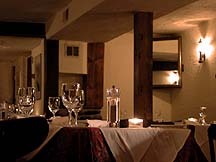 Amberley Castle offers comfort, luxury, fine food and excellent service in surroundings which are quintessentially English. And, best of all, it is a real castle. Amberley, near Arundel, West Sussex BN18 9LT, England.